Matlock situated at the southern end of the Peak District lies on the River Derwent. It was once a spa town which prospered from both the hydrotherapy industry and the cloth mills constructed on the river and its tributary Bentley Brook. Matlock was just a collection of small villages until thermal springs were discovered in 1698. The population increased rapidly in the 1800s largely because of the popular hydro’s which were being built. About twenty hydro’s were built, mostly on Matlock Bank, the largest one being built in 1853 by John Smedley which closed in 1955 and re-opened in 1956 as the headquarters of the Derbyshire County Council. The town also began to gain a reputation as a rather select spa town and then in 1849 with the coming of the railway to Matlock it was transformed into a resort for day-trippers bringing tourist attractions such show caverns, cable railways, petrifying wells, pleasure gardens and more recently a theme park. The section of the railway between Matlock and Buxton was closed in 1968 due to the Beeching cuts but trains still run between Matlock and Derby on the Derwent Valley Line. Peak Rail, a preserved railway, runs steam trains on a section of the closed line between Matlock, Darley Dale and Rowsley. Hall Leys Park is a Victorian public park in the centre of Matlock which opened in 1898 and from 2004 to 2005 underwent major regeneration as part of the Matlock Parks Project. The park is now a central part of the towns flood protection with a wall surrounding the northern side of the park where the footpaths can be sealed with sheets of wood which would dam the progress of any overflow from the river and turn the entire park into a large reservoir. The park provides many facilities such as a putting green, a Crown Green Bowls green, a miniature railway that runs half the length of the park along the river, a children’s playground and a boating lake with several small islands, home to a large number of birds, and also home to the longest running pleasure boats in the country. The Victorian bandstand in the centre of the park is used regularly in the summer months by local brass bands and the park is occasionally the site for Continental Markets, regular Farmers Markets and the Matlock Victorian Christmas Weekend held annually on the first weekend in December. Matlock also has a full range of shops, cafes and pubs. Matlock Bath is set in the beautiful gorge of the River Derwent lying immediately south of Matlock. It was originally built at the head of a dead end dirt road running alongside the valley of the River Derwent and developed in the 19th century as a spa town. Development was and is very restricted due to the steep hillsides so the majority of the buildings are on one side of the valley with only footbridges across the river. In 1698 warm springs were discovered and a bath house was built. Matlock Bath is a good example of an old spa resort with its souvenir shops, amusement arcades, ice-cream parlours and fish and chip shops. There are also a few pubs and cafes. The town’s main attractions are the Heights of Abraham, High Tor which is a sheer cliff popular with climbers and walkers, the Grand Pavilion which is a pleasure palace alongside the River Derwent built in 1910, Gulliver’s Kingdom theme park, the Peak District Mining Museum and the lovely Riverside Gardens and Lovers Walks offering gentle strolls away from the crowds. There is also the Derwent Valley Heritage Trail. Canoeing events are popular in Matlock Bath and the river is used by Matlock canoe club to host competitive (national level) Wild Water Racing and Slalom events and is an assessment location for the BCU 4 Star award. Matlock Bath is also popular as a meeting place for motorcyclists who flock to the village at weekends and bank holidays. Matlock Bath railway station was built in 1849. The Matlock Bath Illuminations are also a popular feature from September to the end of October when the riverside is decorated and the cliffs floodlit to create a magical scene of colour and at weekends there are parades of decorated boats, entertainments and, on certain dates, firework displays. Matlock and Matlock Bath are overlooked by Ribber Castle, a gigantic folly, built in the 1860s by the same John Smedley who constructed the Hydro. The River Derwent which rises on the eastern flank of Bleaklow, east of Glossop, is 50 miles long but due to it meandering a lot in its lower reaches it has an actual length of 66 miles and is a tributary of the River Trent which it joins south of Derby. The river is Derbyshire’s longest river and half of its course flows through the Peak District with the upper reaches passing through the Peak District National Park and its middle reaches around Matlock Bath. It is a rural river apart from a short section through the city of Derby and because of its scenic qualities the valley of the River Derwent is popular with tourists. Between Matlock and Derby the river was one of the cradles of the Industrial Revolution providing power to the first industrial scale cotton mills today it provides a water supply to several surrounding cities. 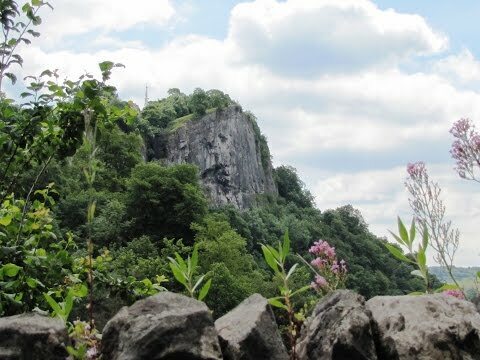 High Tor is a lofty limestone crag which towers over Matlock Bath. It used to be privately owned with an entrance fee but now that it belongs to the local authority it is free to visitors and the climbers who scale the sheer face of the crag to get there. The view from the summit of Matlock Bath and the Heights of Abraham on the opposite hill is very impressive but care is a must be taken especially with children as the cliff edge is totally unfenced. For those with nerves of steel and a good head for heights there is a narrow walkway called Giddy Ledge which winds around a section of the cliff. Behind the tor summit are Fern and Roman caves which are deep clefts in the rock. They are not natural caves but lead veins which have been worked to a depth of up to 10 metres and a width of between one and two metres and are probably amongst the oldest in the area. Both caves are accessible and Roman cave is over 100 metres long and can be walked along the bottom of it quite easily. Heights of Abraham is a major tourist attraction in Matlock Bath consisting of a hilltop park on top of Masson Hill accessed by a Gondola cable car from the village. The park which has been open to visitors since Victorian times, 1780, has remained one of the Peak Districts most popular destinations and has a number of attractions including exhibitions, picnic and play areas, places to eat and drink, cavern and mine tours, the Fossil Factory which is a new addition to the park and magnificent views. There are two caves Great Masson Cavern which was mined for fluorspar and Great Rutland Cavern which was mined for lead and other minerals. When the park first opened the Heights of Abraham was reached on foot which was a steep climb for visitors up the slopes of Masson Hill until the cable car opened in 1984. The cable car which is the first ever alpine style cable car system in Britain has route of 568 metres long and climbs 169 metres. From the telephone box in Starkholmes we turn left down High Tor Road sign posted Public Footpath to Matlock Bath and head forwards to go through a gate into the wood. We head forwards uphill until we come to a sharp bend in the tarmac track. We head forwards onto the grass and then turn right towards the picnic tables. We go up the steps on the left of the picnic tables and follow the path round to the right uphill. We pass a pylon on our right and follow the path over a field this brings us out to the summit of High Tor. We then take the path behind us next to a stump of an old tree downhill to an information board and a seat in a stone shelter. We take the path on the left downhill towards Matlock. We keep following the path which bears right at a view point making our way downhill to a black iron gate. We go through and bear right to come out at the road at Old Matlock. We turn left following the road for a short way and take the lane just past the church. We walk downhill and go through the gate on the left just before the river into a park area. We head forwards with the river on our right following the sign for the war memorial. We go under the railway bridge into another park area. At the end of the park we turn right over the river bridge to the main road then turn left along the pavement to the Matlock Bath sign. We cross the road and take the little road opposite, St. Johns Road, uphill. We now keep heading uphill past an old church until we come to Cliff House and take the path to the right of the gate sign posted Heights of Abraham steeply uphill following the wall. At the top we turn left over the broken wall and follow the fence on our left. We go through a gate and come out into an open field and bear right uphill to the wood. We go through a gate and follow the path until we come to the Heights of Abraham. We go through the gate marked with a yellow arrow into the wood and follow the boundary fence of the Heights of Abraham on our left through the wood and follow the yellow arrows to a gate. We go through the gate and bear left following the sign for Cromford. We pass two gates on our right and keep heading forwards over the field to a post marked with two yellow arrows we bear left downhill. We come to a little track and turn right passing between two houses. At the end of the buildings we turn left and after a short way we come to a post with two yellow arrows we turn left downhill. We go down some steps make our way through the trees until we come to a minor road we turn right down to the main road. We turn left following the pavement to the outskirts of Matlock Bath and turn right down the side of the museum to the River Derwent and Riverside Park. We turn right walking through the park to cross over the river bridge. We turn left and follow the river on our left past a children’s play park, stone shelter, information board and a red wooden shelter until we come to a sign saying not advisable to pass beyond this point. We turn right on the path going steeply uphill. We come to an information board and keep heading forwards going downhill to the station car park. We make our way to the information centre turn right signposted High Tor and cross over the railway line. We turn left and follow the path at the side of the line. At the end we turn right uphill through a gate sign posted High Tor. We keep heading forwards on the main track which bears left just after two stone posts. The track becomes a tarmac track and we keep heading forwards to the houses and a lane at the top. We turn right back to the road and our parked car. This is a moderate walk on good or grassy paths and tracks with some steep inclines and declines. There are a number of gates and stiles. Approx 4.75 miles allow 2½ to 3 hours using OS Explorer Map OL24, The Peak District White Peak area. Start point: Near the telephone box on the edge of the village of Starkholmes (above and to the east of Matlock Bath). Matlock Bath which is just south of Matlock in the Peak District, Derbyshire. From the M1 take junction 29. Take the A617 westwards to Chesterfield. At Chesterfield take the A619. At New Brampton take a left turn onto the A632 towards Matlock. On reaching the A615 turn left then immediate right for Old Matlock. Follow this road for about ¾ of a mile towards Starkholmes. Parking is at the side of the road. Parking: Free roadside parking. There are pay and display car parks in Matlock and Matlock Bath. There are public toilets in Matlock, Matlock Bath and also in the museum and at the railway station. For refreshments there is the White Lion at Starkholmes and the Duke William at Old Matlock. There are also many shops, cafes, pubs, takeaways in Matlock and Matlock Bath.